Volunteers move quickly to relocate a loggerhead sea turtle’s eggs so they would survive high tide, on Sunday, July 8. Michael Hess was walking along the Fenwick Island beach at James Street on Sunday, July 8, before sunrise, searching for hidden treasure with his metal detector. His normal routine was interrupted by an unusual sight ahead of him. Upon closer inspection, he came to realize what he had thought was a coconut washed ashore was a sea turtle laying her eggs — a loggerhead sea turtle, to be exact. Hess managed to flag down another man on the beach, who monitored the turtle with Hess’ wife as he went to notify police of his finding. On his way up the beach, he saw a woman and asked her to call the police. The turtle was already laying eggs at 5 a.m., when Hess arrived. By 7 or 7:30 a.m., 78 eggs were buried in the sand, and the mother headed toward the ocean. The police roped off the area surrounding the nest, as instructed by the Marine Education, Research & Rehabilitation Institute Inc., or MERR Institute. The MERR Institute is a non-profit rescue and research organization that provides 24/7 on-call service for “ill, injured, entangled or otherwise in need” marine mammals and sea turtles. The organization also conducts research on reported strandings. “My responders were on scene since 8:30 a.m. and were there throughout the day until we got authorization to move the nest,” said Suzanne Thurman, executive director of the MERR Institute. Sea turtle nesting is overseen by the U.S. Fish & Wildlife Service. Delaware has an agreement with the U.S Fish & Wildlife Service, under Section 6 of the Endangered Species Act. 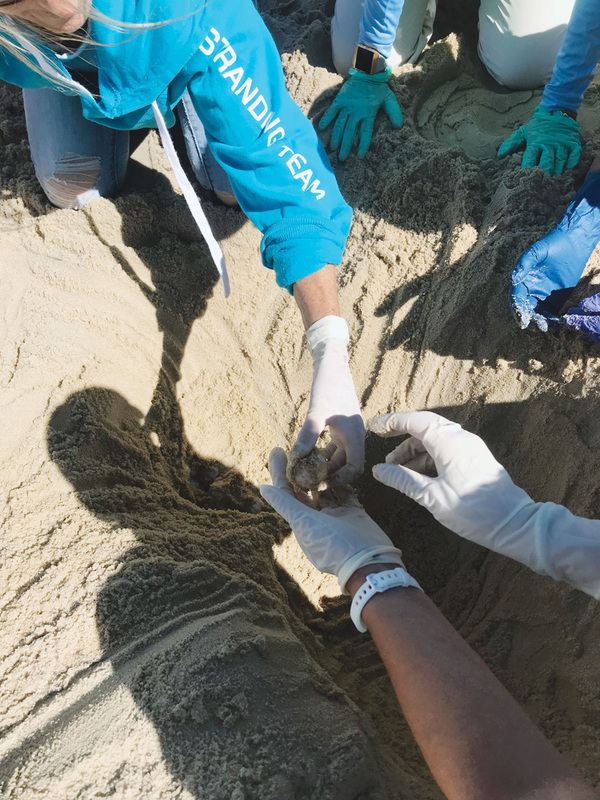 The MERR Institute responders had to receive permits from the Delaware Department of Natural Resources & Environmental Control (DNREC) to be able to move the eggs, because loggerhead sea turtles are endangered in the northeast Atlantic Ocean. Due to the time-sensitive nature of the matter, DNREC Environmental Program Administrator Robert Hossler gave Thurman his verbal approval to transport the eggs, about 3 p.m. The eggs would not have survived high tide that evening or the impending beach replenishment project. The relocation area will not be disclosed. “We then kept watch over the relocated nest throughout the night, and the following day, until a predator excluder could be put into place, which was done by DNREC. We did this to deter predators, such as foxes, raccoons, crows and gulls,” Thurman added. The predator excluder is essentially fencing to protect the eggs until they hatch, in approximately 68 to 75 days. Although sea turtles are common to the area — the MERR Institute has already responded to nine incidents involving sea turtles this season — it is not normal for them to be nesting on Delaware beaches. The only other sea turtle nesting reported in the area was in 2011, when a green sea turtle laid eggs at Cape Henlopen State Park. There are several other reasons why the nesting was rare. Female sea turtles usually nest collectively, but the sighting was of a lone mother turtle. Additionally, the loggerhead only had three flippers. “She was missing the back right flipper that is used to dig the hole to lay eggs and cover it,” Hess said. He recalled that about 20 people gathered for the extraordinary sighting, but those present remained at least 15 feet away from the nest and restricted others from accessing the area. “It’s amazing how people came together,” Hess said, reflecting with pride on everyone’s efforts that day.